I did end up going out last night, and enjoyed an absolutely delicious Moroccan dinner at Casbah! I had the Sultan's Kabob Feast, which had beef, lamb, and chicken skewers served with jasmine rice. I also ordered the couscous, which was great! 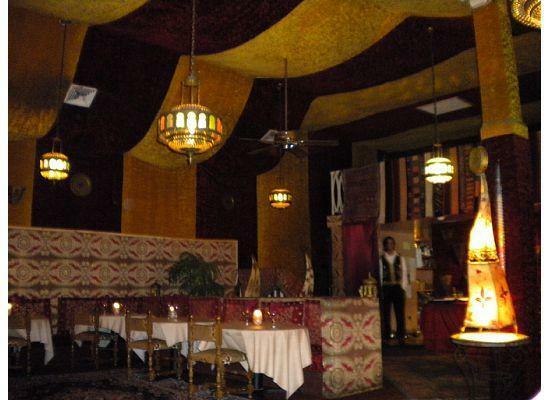 One of the fun things about Casbah (aside from the belly dancer trying to make you dance) is that they wash your hands at your table, and you eat your meal with your fingers! I will admit that it was a bit strange at first (using bread to scoop rice/couscous did help) but very fun and different. Afterwards, my friends and I headed over to Club One to catch the end of the drag cabaret, which I love to see when I can. Moroccan food and drag queens make for an awesome night out! And as NM pointed out to me, going out on Friday (even after a tiring work day) means you have Saturday to recover and Sunday to relax.